Want to see behind the eyes of Fashion Week? Well now you can. 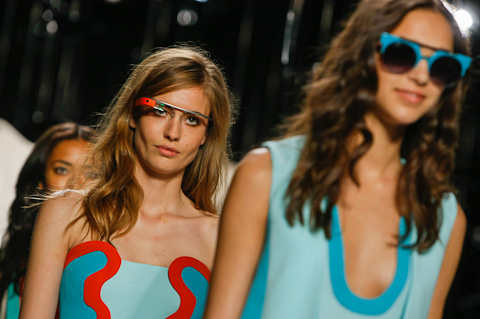 Google has asked designer Diane von Furstenberg, her team and models to wear a new camera they have brought out which is placed beside the eye to record exactly what someone can see. The Result? A fascinating video that even created butterflies in my stomach as one model made her way to open the show on front of 300 people! The work, dedication and glamour is finally visible to OUR eyes. Fashion designer Diane von Furstenberg gave out mini American flags at the end of her New York fashion show, which took place on the 10th anniversary of 9/11, in memory of the shocking day. The show was named beginning’s, and it certainly gave out that feeling. I must say, for such a commercial designer this show is impressive! Well done DVF. Diane von Furstenberg has opened her second store in New York with her Creative Director Yvan Mispelaere. The store, which is located at 135 Wooster Street in Soho, gives off a downtown edgy vibe. The 1,650 square-foot space is filled with stand out prints, vibrant colours and wrap dress after wrap dress. All DVF classics. It also contains a whole room dedicated to accessories only and plasma screens placed everywhere showing backstage looks from the DVF fashion show and twitter feeds from DVF herself. Girls, get shopping!